Notes on this edition: Julian Barnes. Upstream! / Controcorrente. Rome: La Biblioteca di Repubblica – L’Espresso, 2008. Pp. 95 + . 17.9 x 13.5 cm. Translated by Riccardo Mainardi. (Dual Language edition in English & Italian). This book is #10 in a series of dual language publications that print the English and Italian translation side-by-side. Excerpts the chapter “Upstream!” from Julian Barnes’s A History of the World in 10½ Chapters along with Riccardo Mainardi’s translation for the Giulio Einaudi edition of the novel originally published in 1997. Notes on this edition: Julian Barnes. Pulse: Stories. New York: Vintage International, 2012. Pp. 227 + . 20.2 x 13 cm. ISBN: 9780307742407. 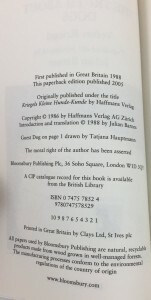 First American edition with “First Vintage International Edition, Feburary 2012” printed to the copyright page. Paper covers with book design by Michael Appuhn. Editorial Anagrama issued El loro de Flaubert in a compact edition (Compactos 86). The book pictured is the 3rd printing (“Tercera edición”) published in 1997. 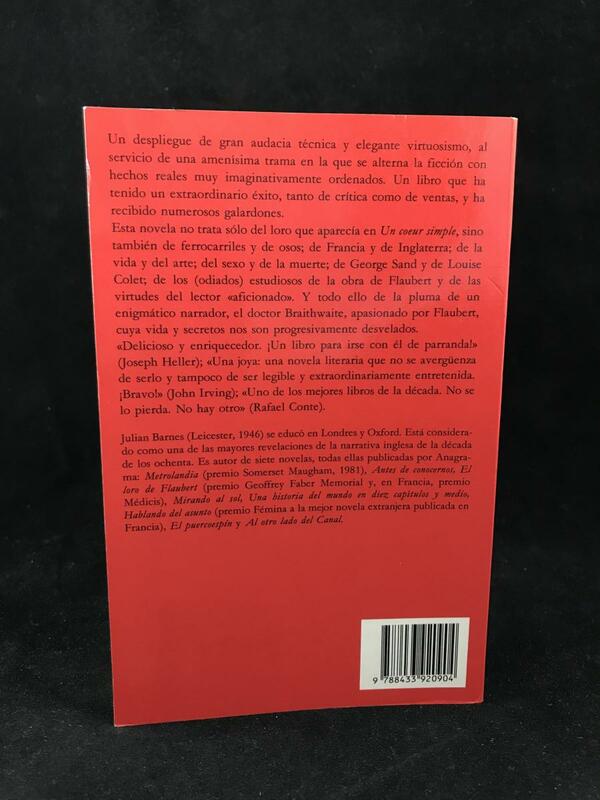 Also pictured (below) is the 5th printing (“Quinta edición”), published in September 2001 and the 11th printing published in 2016. Notes on this edition: Dan Kavanagh. 顔役を擊て (Kaoyaku o utte) | Duffy. Tokyo: Hayakawa Shobō, 1981. Pp. 169 + . 18.3 x 10.6 cm. Translated by Yoshinobu Tamura. (Japanese). 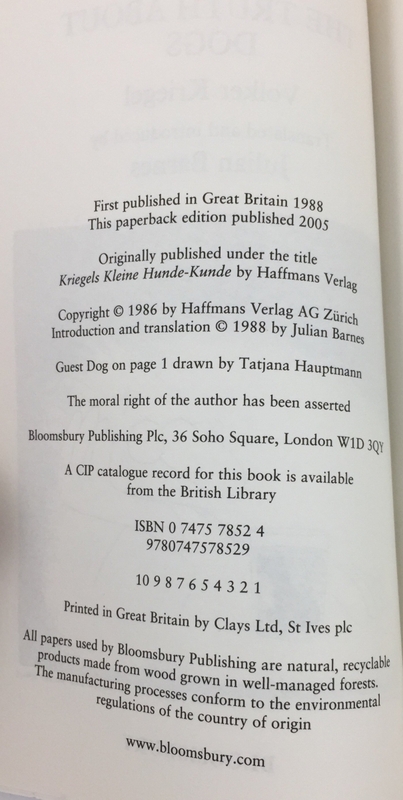 Hayakawa Shobō published this Japanese translation of Duffy, Julian Barnes’s first novel using the pseudonym “Dan Kavanagh”, the year after its English publication by Jonathan Cape in 1980. Published as a paperback issued in publisher’s protective plastic cover. Notes on this edition: Julian Barnes. The Sense of an Ending. Paris: Harrap/Larousse, 2013. Pp. 156 + . 19.1 x 12.5 cm. ISBN: 9782818702796. This edition publishes the English text with key words translated into French in the margins to assist French readers wishing to read the original English. The cover states: “Lire en anglais avec la traduction des mots-clés” (“Read in English with the translation of key words”). Notes on this edition: Julian Barnes. Une histoire du monde en 10 chapitres 1/2 | A History of the World in 10½ Chapters. Paris: Mercure de France, 2011. Pp. 482 + . 20.5 x 14 cm. Translated by Michel Courtois-Fourcy. ISBN: 9782715231566 (French). 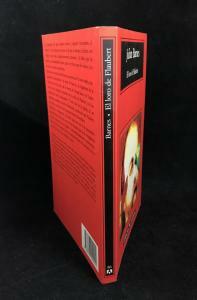 French edition reissued in 2011, with wrap-around paper band. Notes on this edition: Julian Barnes. Rien à craindre | Nothing to Be Frightened of. Mercure de France, 2009. Pp. 301  + . 20.5 x 14 cm. Translated by Jean-Pierre Aoustin. ISBN: 9782715228726. (French). This is the first French edition published in January 2009, issued with wrap-around paper band. Later in 2009, the Gallimard Folio edition appeared (series no. 5070). Notes on this edition: Volker Kriegel. The Truth about Dogs. London: Bloomsbury, 2005. Pp. 121 + . 17.7 x 11. cm. ISBN: 0747578524. £5.99. First published by Bloomsbury in hardback, this edition features a newly designed paper cover in blue-green. Originally published as Kriegels Kleine Hunde-Kunde by Volker Kriegel. 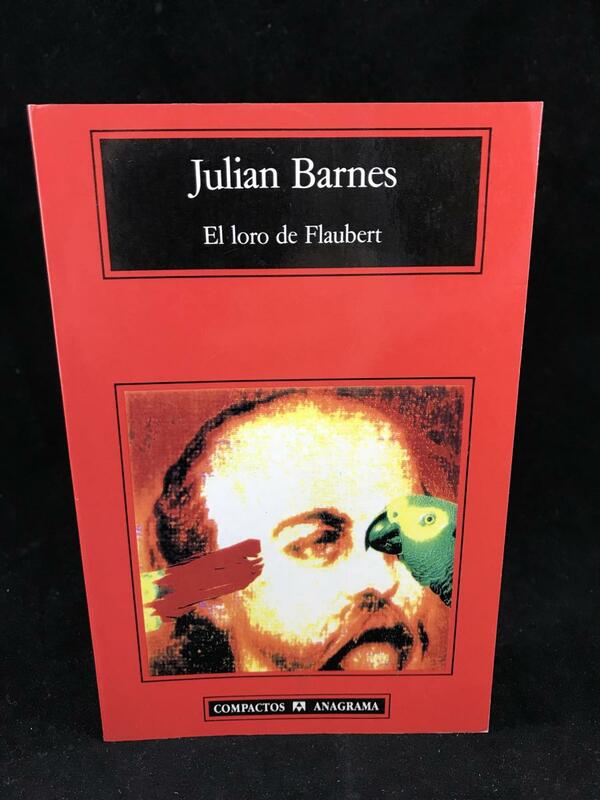 Translated and with an introduction by Julian Barnes. Notes on this edition: Julian Barnes. Pedantul în bucătărie | The Pedant in the Kitchen. 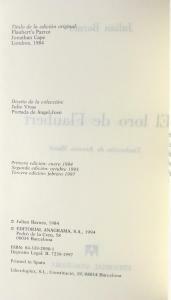 Bucureşti: Editura Nemira, 2006. Pp. 182  + . 17.9 x 10.2 cm. Translated by Marina Radu. 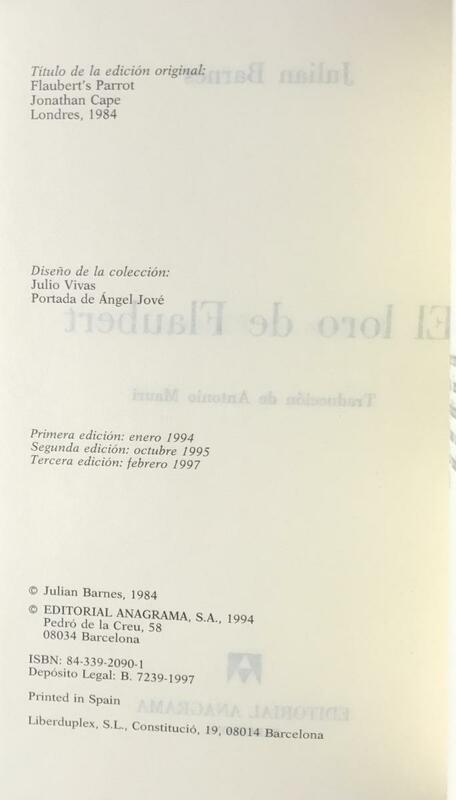 ISBN: 9735697882. (Romanian). The Romanian edition of Julian Barnes’s collection of cookery essays The Pedant in the Kitchen include the original illustrations by Joe Berger that first appeared in The Guardian alongside Barnes’s essays. Also featured in the photographs is a promotional bookmark that was inserted into this copy of the book.